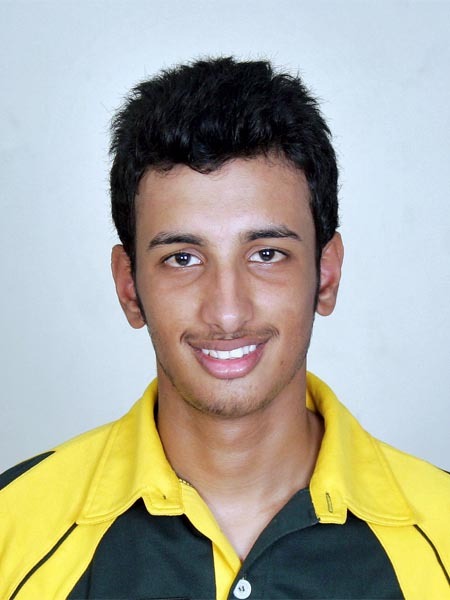 Shan Masood, 22, is a left-handed opening batsman who has represented Pakistan at U-15 and U-19 level and was named vice-captain at the 2008 U-19 World Cup in Malaysia. He plays for HBL and has been invited to the PCB's emerging players camp at NCA. Shan Masood, 22, is a left-handed opening batsman who has represented Pakistan at Under-15 and Under-19 level and was named vice-captain at the 2008 U-19 World Cup in Malaysia. He plays for Habib Bank and an impressive season, scoring over a thousand runs in his first full First Class season and his good form, has resulted in an invitation to the Pakistan Cricket Board's emerging players camp at the National Cricket Academy, Lahore. He spoke to PakPassion before he set off for the camp in Pakistan. The passion for cricket always ran through the family – my dad, uncles and two brothers were avid cricket watchers. My dad got me into an academy set up by ex-Pakistan international Sikander Bakht. They normally take kids at seven years old and above, but they took me at five because they probably saw something in me which they could develop. I started playing hard ball cricket when I was eight or nine years old and took the game up as a hobby as I liked playing a lot. My family focused strongly on education and nobody in my family has ever pursued sports as a professional before. However, I kept playing cricket and was selected for the Pakistan U-15s as Aqib Javed saw potential in me. I was only 13 years old at that time yet he decided to take me to the 2002 U-15 Asia Cup. It was at that point I realised I had the potential to move up. I made my First Class debut for Karachi, scoring 54 against Hyderabad where I opened the innings with Asad Shafiq and we shared a stand of 150-odd. After that I was heavily involved with the Pakistan U-19s in 2007 and up to the World Cup in 2008. I returned when I had completed my time with the U-19s but I didn't receive many opportunities at Karachi. I was scoring heavily for Habib Bank but when it came to playing the Pentangular Trophy for Sindh or other T20 matches for Karachi, I never got the nod. Islamabad offered me a place in their team because they were short of good batsmen and I played for the Islamabad Leopards T20 side. I am now registered back with Karachi, at Pakistan Cricket Club run by Azam Khan who have players like Asad Shafiq, Sarfraz Ahmed and Rameez Raja jr. In Karachi, I originally started off at a club called Mohammad Hussein CC run by Musher Rabbani, so I have always been heavily involved in club cricket in Karachi. My time at Durham was very good. I was coached by ex-England international Graeme Fowler and managed to get in three First Class cricket games for the University as well. I carried my bat against the Durham County side, scoring 60 or so runs. I also scored runs against Yorkshire and Warwickshire. It's been a very useful experience as I am facing, in English conditions, bowlers who have played international cricket. I have played against Liam Plunkett, Graham Onions and Ajmal Shehzad, offering me the opportunity to measure myself against them and I coped well. Having said that, there is a misconception that Pakistani domestic cricket is played on slow, low batting wickets. Playing for Habib bank for the last three years, we've played the majority of the matches in Punjab during the winter season so we get wickets heavily coated with grass and have to face top bowlers too – in the last few years we've had Mohammad Talha, Asad Ali, Mohammad Sami, Wahab Riaz, Umaid Asif, Rana Naved and Sarfraz Ahmed. The standard of bowling in Pakistan is pretty good so I'd say it wasn't that much of a step up in terms of quality, but the conditions in England were certainly more difficult, with the ball moving around all day meaning it can be difficult to manage footwork even when well-settled at the crease. I remember I was playing against Durham, and I glanced two fours on the legside to Liam Plunkett. The next ball was on the same spot but I ended up being beaten and the ball going through to the keeper. I have always given importance to my technique and consider myself to be technically sound. We've had matches such as the Quaid-e-Azam Trophy final in 2010 when we [Habib Bank] were playing against PIA under lights – the match was played under lights with the orange ball. They had Najaf Shah, Anwar Ali and Aizaz Cheema in their attack. Aizaz had picked up around 50 wickets in six matches that season, which was also the season where he was selected for Pakistan so he was in good form. I had a match-winning partnership with Imran Farhat and got a half-century - I've played a lot of those kinds of knocks, where we've played on very hard wickets and I've always managed to get my team through. I scored a 127 against Wahab Riaz and we topped the table and went to the final with that win in the 2010 season. I like to bat for long periods but I am not a one-format player – I've done well in one-day competitions as well. I had an average of 80 in the previous year and played a man-of-the-match innings in the Final against National Bank in the Faysal Bank One Day National Cup Division One 2010-11. I'm an accumulator, the dependable player who can be relied upon by the team. I've played for Habib Bank for the last three years and have never been dropped, playing every game when I'm there and that measures my worth in the team – we have Test superstars and could field 11 international players but I'm viewed as someone dependable who can occupy the crease so am handy for the team. You never stop learning, until you retire! There are times when I could be more positive, more aggressive which I think will come with greater match experience. I'm only 22 and this year was my first full First Class season. There are times when I only play five or six matches in a First Class season so you have to make them count, meaning you don't have the confidence to improvise. This season I managed to score a thousand runs – 700 for Habib Bank and 300 for the Federal team in the Pentangular Cup. Hopefully, next year if I'm selected and as I gain more match experience I can improvise more, be more aggressive and positive. The team I'm representing feels like the full Pakistan side, as the Habib Bank team has a lot of quality players and playing with those guys would give me more confidence. My favoured position has always been that of opener. I've played matches for Habib Bank where at times we've had Taufeeq Umar, Imran Farhat and Ahmed Shehzad and particularly in four-day matches, I've raised my hand and gone out to open, whether it's being put in on a horrible pitch – I've opened my whole life. Alastair Cook is my cricketing role model. He's the biggest role model for any left-handed opening batsman. I'm not going to say I'm going to emulate him, as I'm not at his level yet, but that's my position and what I want to be. My short-term aim is to work hard for the three-week camp. As soon as the one-day final finished against PIA, from then on I worked hard in the gym, hit the nets every day and played league cricket in England, in the Kent Premier League, which is one of the best leagues in England at the moment. My training and rehab work has been up to standard, so I'm hoping this camp will give me the most ideal opportunity to polish what I've been working on for next season. Hopefully I can use this camp as a stepping stone to make a name for myself. If you do well at the academy, you are in the eyes of the selectors and coaches – we have a new coach and you never know who might like you, or where. That's how funny cricket is – you may be picked when you don't even expect it. I got out to Wayne Parnell in the semi final and when I look back at myself back then, I feel like a completely different person, far more mature. I was 17-18 year old then and was more nervous, didn't have maturity to my game. Cricket requires a mature mind – it's more a mental game than physical and I look at myself right now, when I face big stars like Wahab or Sami, internationally-experienced bowlers, I'm more confident. I've always focused on my education. I did well in my O-Levels, A-Levels and have come to England to study at a good university. As a Pakistani child its very difficult to balance studies and cricket. There is no correlation between the two so you play cricket or you go to a good school. I've done both and sailed in two boats at once. That has taught me maturity and being level-headed as well as self discipline. I've played for Pakistan A side, U-19s and studied and it's helped me to mature as a person. It's the main difference between the Shan Masood at 18 years old and Shan Masood of 2012.